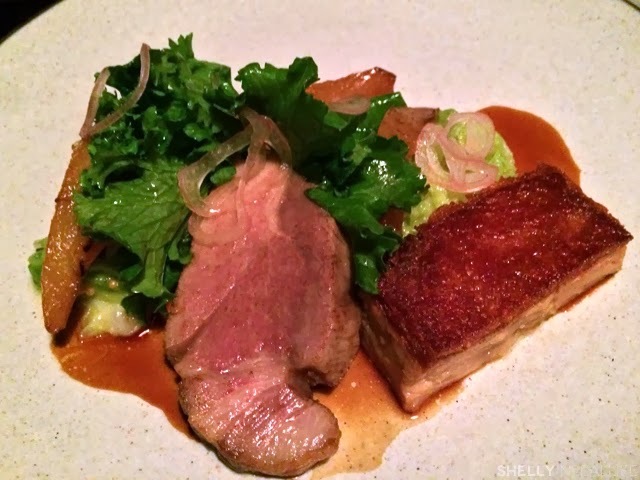 It's no secret that I love Chef Daniel Humm and The NoMad is easily one of the best restaurants I've eaten at in 2013, or maybe even EVER. This post will be a quick update to my experience back in May 2013. Also, I just got my new iPhone 5S, so most of the pictures from this post is taken with that, obviously not as good as my Panasonic GF5X, but not bad for a camera phone right? After hearing some good news from a friend Tuesday afternoon, we wanted to celebrate. So what better place to choose than our neighborhood favorite? 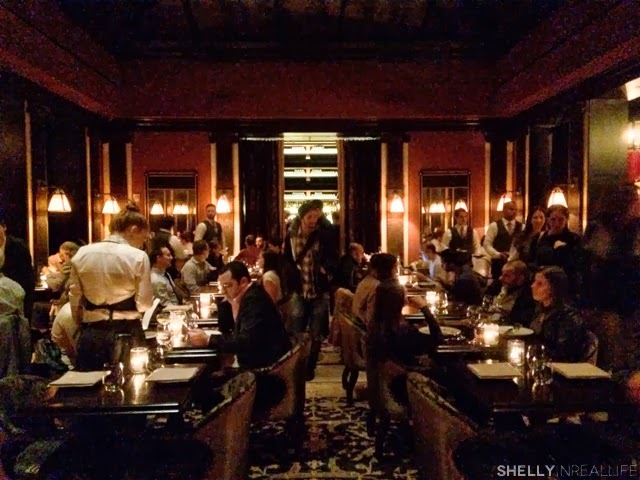 We were able to get a super last minute reservation on OpenTable for three people at 10:15pm. 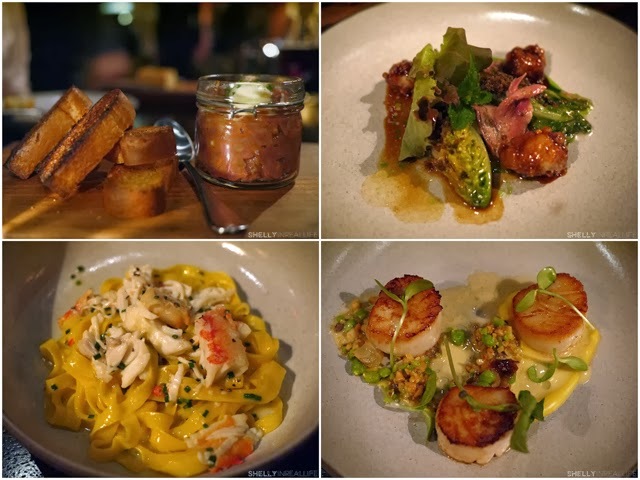 We went in knowing a few dishes that weren't standouts, tasty, but wouldn't order again. That was the two appetizers: Lamb with Sweetbreads and the King Crab Tagliatelle and the Scallop Entree. Our must orders were the Roast Chicken for Two (their signature dish) and the Steak Tartare. 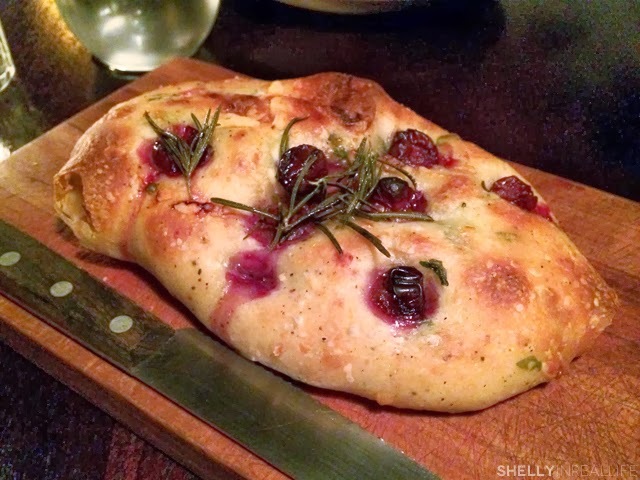 The focaccia bread this time around was topped with Rosemary and Cranberry, truly a lovely addition to this bread. It gave it just a slight hint of tartness but still had a burst of sweetness. Loved it. As much as I love foie, I usually don't order foie gras that has been prepared as a terrine or torchon because it feels a bit plain to me since it's just cooked as pure liver that's steamed. I've ordered it prepared this way a few times only to discover it's just wasted on me, like the times at Per Se and Ai Fiori. The cost-benefit for me just isn't worth it, especially when I'm still living in the memory of seared foie gras for $3 in San Sebastian. 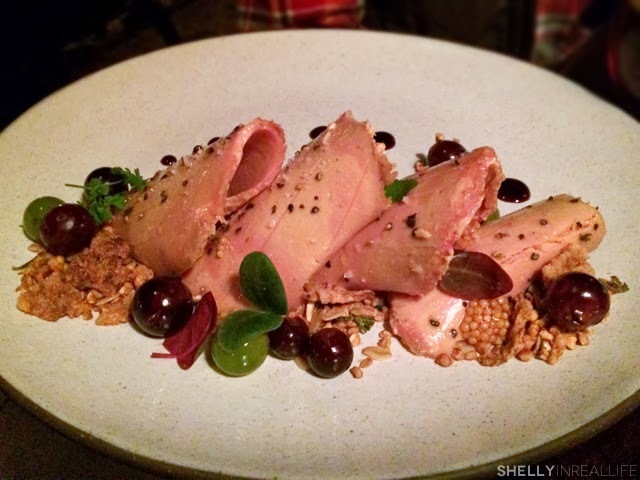 However, we figured we'd try it at The NoMad, and boy am I glad we did. First, the dish is visually stunning. Instead of serving us a whole chunk of foie, I love how the Foie Gras Terrine here is sliced ever so thinly and plated with each of the elements as they each play a purpose to the dish. The foie is served with a crunchy piece of whole wheat toast, and I just enjoyed laying a piece of foie on that, and offsetting everything with a sweet juicy grape, the verjus (which is a grape reduction) and the crunchy fried buckwheat that gave it even more texture. Well done NoMad, well done. I love this dish, easily my favorite of the night! 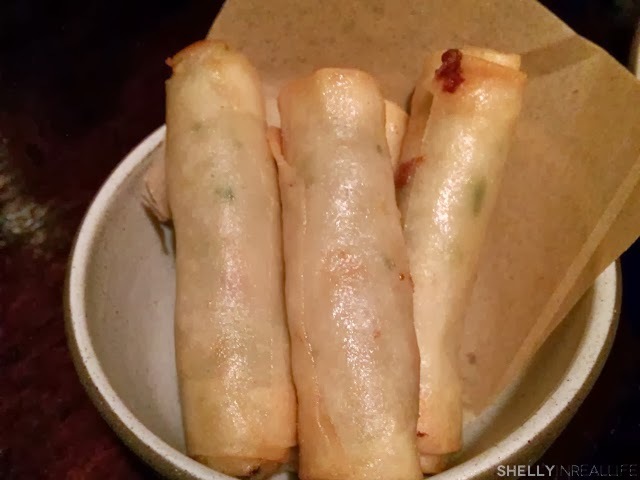 We also ended up ordering two other appetizers, the Sweetbreads which was rolled into an eggroll and fried. For $9, there were 4 pieces of these snacks - not too bad if you want to try, but it didn't especially stand out. 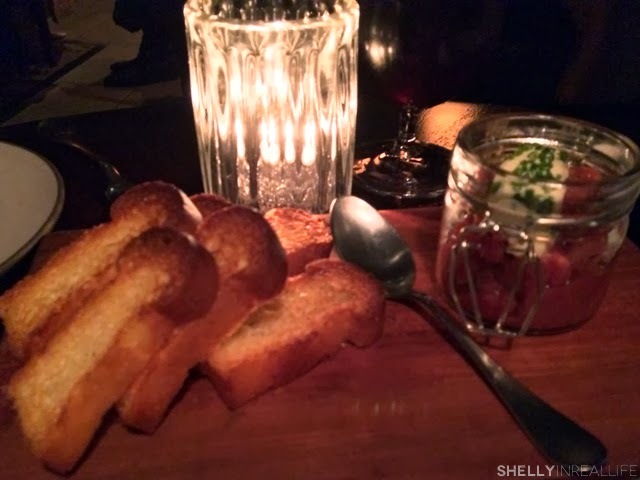 Since the Steak Tartare was one of my favorites last time, we ordered it again. Once again, it was delicious as expected, so I highly recommend you try this! The other reason why I am writing this update is for the new way they are now preparing the dark meat of the roast chicken. As I mentioned in my previous post, in order for the white breast meat to be perfectly moist, the roast chicken has to come out of the oven before the dark meat is cooked to temperature. 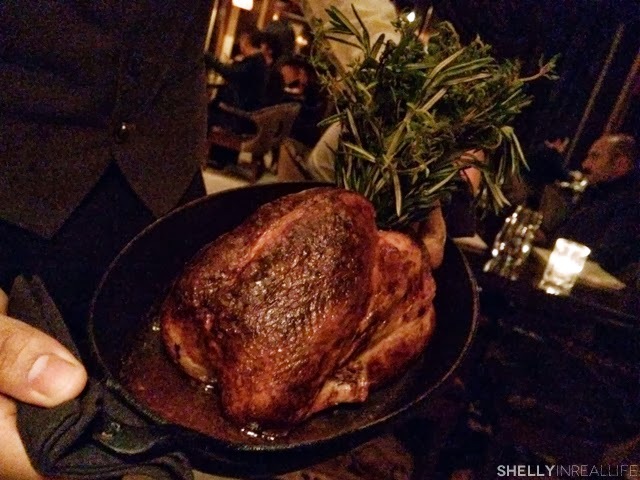 So Chef Daniel Humm takes the slightly undercooked bird out of the oven, brings it to your table so you can admire the carmel roasted color on the breast, takes the bird back to carve off the breast for plating, then also carves the dark meat off the chicken for it to be cooked on the stove top. Last time I tried the dark meat casserole, I thought the cream sauce added to the chicken was way overwhelming and completely took over the dish. It looks like the folks in the kitchen got the memo because the new dark meat casserole blew me away. 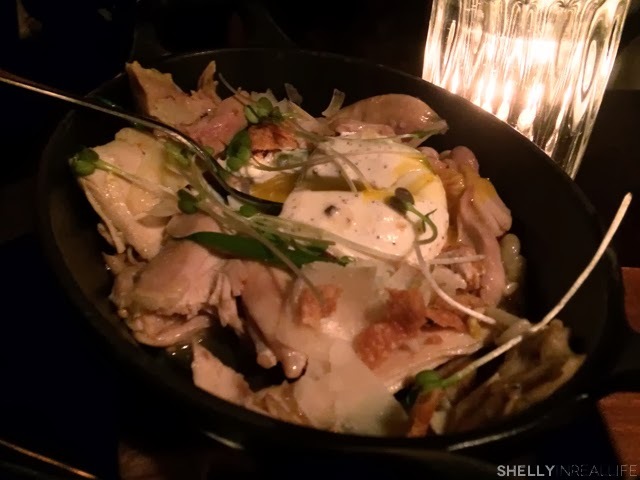 If Morimoto has a dish called Duck Duck Duck featuring duck cooked 3 ways, then this new dark meat dish at the Nomad should be called Chicken Chicken Chicken. Instead of completely drenching the dark meat in vin jaune hollandaise, the chicken is now lightly sauced, but even better, served with a poached egg with a beautifully runny yolk which complements the sauce and lightens it up a bit. For added texture, there is now fried chicken skin that brings the perfect crunch that this dish needs. As a final touch, there is also some beans to let you soak up the sauce with and devour. This transformation of the dark meat preparation just really shows how some tweaks to a recipe can be night and day. We ended up ordering the Suckling Pig again which was confit with pears, cabbage and mustard. I enjoyed the dish more this time around because the skin on top of the confit was so crunchy and the other part of the pork paired really well with the pears. 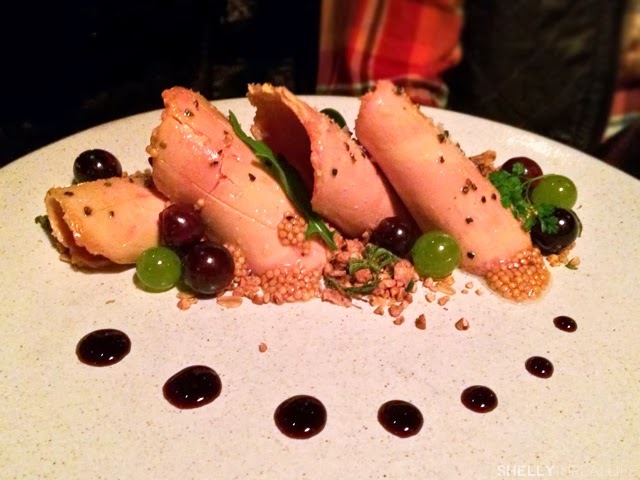 Last time the much talked about Milk and Honey dessert wasn't available to us so we didn't get to try. 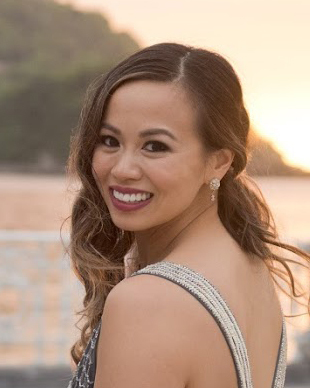 Luckily, it's back on the menu so I was finally able to see what everyone is raving about! 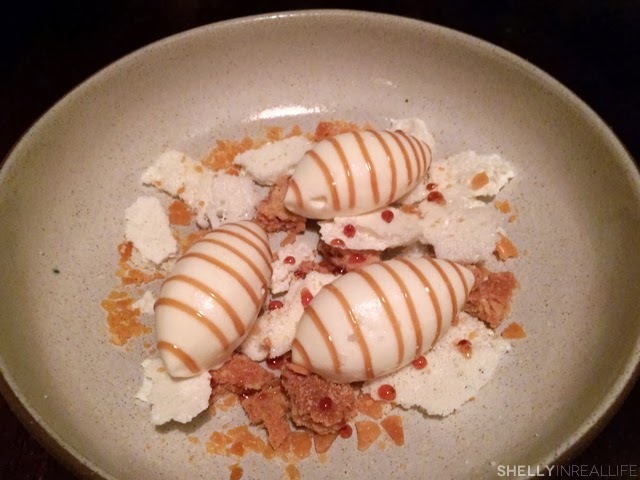 The NoMad's take on Milk & Honey comes with shortbread, brittle and ice cream. The brittle was a fun and light crunchy bite next to the not too sweet ice cream that was lined with honey. Visually, the dish is so delicious. I wouldn't say I would be craving this dessert (I'm not a sweets person), but definitely was a memorable dish and worth trying. 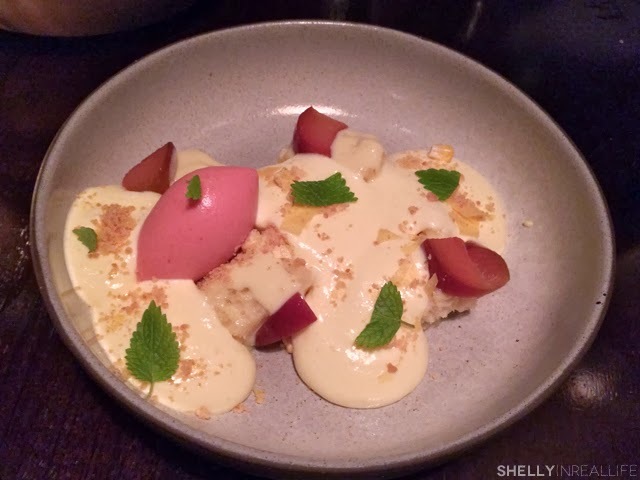 The other dessert we tried was a Plum Cake which was poached plums with angel food cake. As a dessert person, J said he liked this dessert more. The warm cake along with the creme just embraces you and gives your mouth a nice big hug. J noted that this was also much more comforting than the crunchy coldness of Milk & Honey. All in all, this was a great meal and a great way to celebrate. However, I do have to note our spotty service as we completely felt rushed through our appetizers. 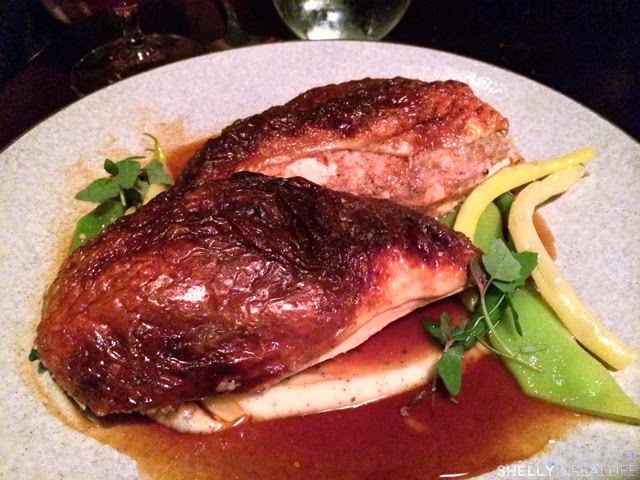 As I was throughly enjoying my foie dish - the server brought the chicken out for us to look at. And soon after, when there was still foie left on our plate!! !, another server tried to take it away from us, preparing to serve us our entrees. Felt like it was a bit of amateur hour for this One Michelin Star restaurant, but the food was on point and quickly made me forget about them trying to take my beloved foie dish away. Not sure if this is a mistake or if they were training a new guy that night since service was great for us the last time we went. 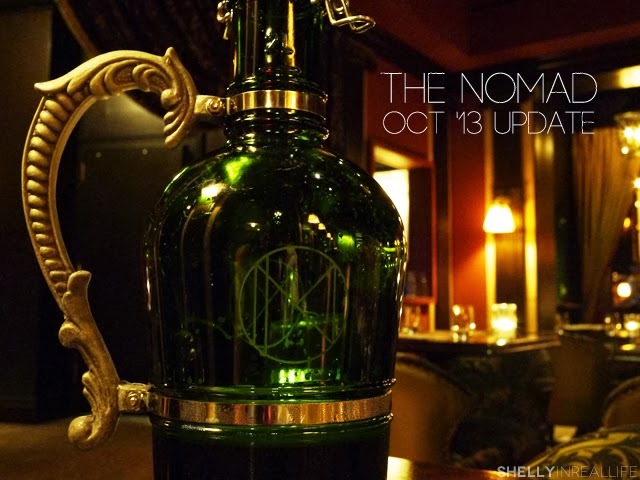 Either way, check out the NoMad soon, and get my must gets: Steak Tartare, Foie Gras Terrine and the Roast Chicken for 2!